Stella Maris Catholic Church Sullivan’s Island sits in historic Moultrieville, named for its proximity to Fort Moultrie. It is the second Catholic church on the island, replacing St. John the Baptist Church. That church was officially discontinued after the Civil War and lost to a cyclone in 1885. 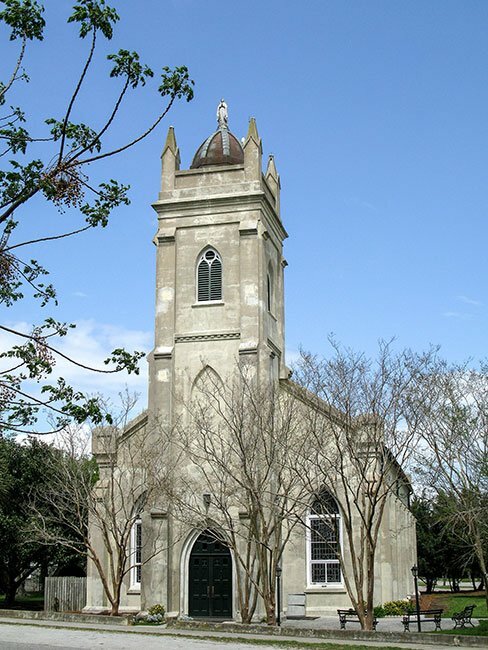 St. John the Baptist was founded in the 1840s when Irish immigrants came to work on projects on the resort island as part of the United States Army Corps of Engineers. However, it suffered extensive damage after being bombarded by Federal troops during the Civil War. After the war, the Vicar General of the Diocese of Charleston, Father Timothy Bermingham, tried to salvage St. John the Baptist to no avail. A lot was purchased for a new building in 1868, and the cornerstone for Stella Maris – which means “Star of the Sea” – was laid on January 18, 1869. The edifice was completed in 1873. Sadly, Father Bermingham died in 1872 and never got to see the finished church. The striking bell tower was added to the church in 1882, and the building was stuccoed in 1885. Unfortunately, Stella Maris was damaged during the earthquake of 1886 and again during a cyclone in 1893, though it survived both events as well as Hurricane Hugo in 1989. 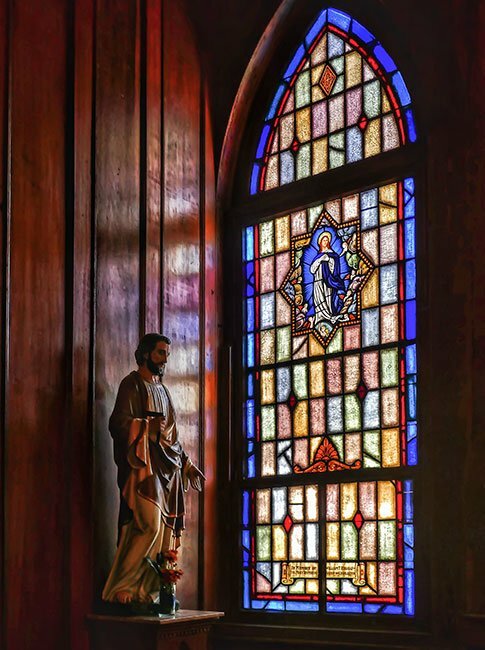 The stained glass windows that grace the church were installed in 1955. Prior to the closing of Fort Moultrie in 1947, glass would often shatter across the island as a result from the firing of guns. The Moultrieville Historic District is a relatively small collection of “island houses” that are located on the west end of Sullivan’s Island. The district includes eighteen contributing buildings and one contributing site. All but one of the buildings are now residences, with the remaining building being Stella Maris Catholic Church, and the site is a small memorial park. There are also five noncontributing residences in the district. The period of significance for the district extends from circa 1830 through circa 1930 and reflects the construction dates of its earliest and latest contributing extant buildings. The district includes houses from the earliest period of resort housing on the island. The architectural character of the traditional residential architecture of Sullivan’s Island is directly related to the island’s historic role as a resort community primarily serving nearby Charleston. Most of the island’s houses were originally constructed as seasonal summertime dwellings. The fact that they were most often not their owner’s primary residences affected the design and construction of the houses and often resulted in evolutionary construction. The climate on the island is also a harsh one for the predominantly frame construction of the houses, as they are subjected to extreme sun, high humidity, prevailing coastal breezes, and occasional hurricanes. Ranging from simple transient vernacular cottages to more elaborate permanent dwellings, each house reflects not only the personality of its original owners but also the changing tastes of subsequent owners and adaptations that were made in response to deterioration and damages brought on by climatic conditions. All of these factors have resulted in an eclectic mix of housing types that somehow manages to blend together with their landscape to form the island’s unique built environment. 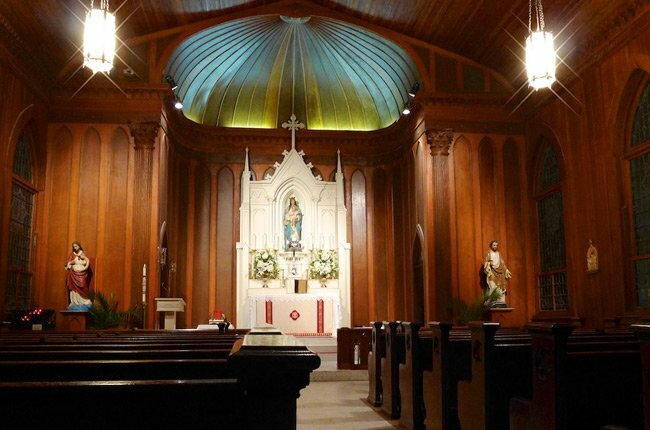 Stella Maris is such a quaint little church. The best part is they offer the traditional Latin Mass. My family and I attend the Latin Mass at Prince Of Peace Catholic Church in Taylors, SC, so it’s such a treat to visit Stella Maris. Matthew, This is also one of the most architecturally captivating churches for me. I notice the photo is copyrighted but I pinned it. Is that OK? Matthew what a beautiful shot of this church!..well done!